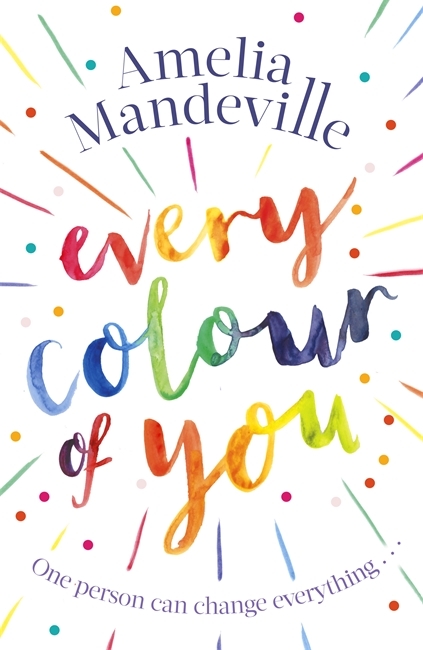 ‘Every Colour Of You’ is the latest book by Amelia Mandeville. Zoe’s life is full of colour. A fan of impromptu yoga, inspirational quotes and experimenting with hair dye, she’s on a mission to make the most of each and every day – even if she is currently spending most of her time behind a checkout till. Then she meets Tristan. The rumour is that since his dad died, Tristan’s life has fallen apart. No one has seen him for months. But now he’s reappeared, does that mean he’s back to ‘normal’? Zoe soon realises Tristan is struggling with a sadness that she can’t possibly understand and becomes determined to bring a world of colour back into his life. But the harder she tries, the more she realises it’s something she can’t fix – and in trying to put him back together, a part of her is beginning to fall apart. ‘Every Colour Of You’ is a tender and sweet story that made for bittersweet reading. When Zoe and Tristan meet one day, their lives change forever. Still recovering from his father’s death, Tristan is finding life hard but luckily Zoe comes into his life offering a welcome distraction from the dark clouds with her vibrant colours and personality. The story is seen from the narrative of both characters and the words seem to spring off the pages with Zoe. She’s fun, outspoken and is always wanting to make things better and more worthwhile for Tristan, she wants to make him happy and thinks that she can do it in her own unique way. Whilst Tristan is quiet and subdued, he finds himself warming to Zoe’s eccentricies and enjoyed the unexpected girl that has came into his life. But as much as he enjoys this new friendship, he also has to deal with the struggles of mental health and this can make for dark and unsettling reading as Tristan contemplates life and his own mortality. The story is a bittersweet tale of friendship and new beginnings, as one friend looks out for the other to make their life happier with a little bit of colour and fun. The scenes with the characters are fun and sweet and I loved how the pair of them bounced off each other, with their wit and their honesty in life. ‘Every Colour Of You’ is Amelia’s debut novel and it’s a sweet one at that. Heartfelt and uplifting, this book is about real life struggles and issues that is written tenderly with a splash of humour. You can buy Every Colour Of You from Amazon and is available to buy from good bookshops.